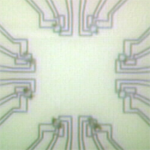 The ability to perform biological laboratory operations via biomolecular recognition in miniaturized (lab-on-a-chip) devices has many technological, economic and social benefits: reduction of the time and cost of the analysis, high sensitivity and wide screening of patients in point of care applications. In this context, spintronics devices offer a unique combination of features, making them very promising for the implementation of highly sensitive biosensors: magnetoresistive transducers, like giant magnetoresistance (GMR) or tunnelling magnetoresistance (TMR) sensors, are employed for the detection of the magnetic beads, which are used as labels of target molecules. The sensor, or its active area, has to be functionalized with the complementary molecular probe to immobilize the target molecules bound to the beads at its surface, thus giving an electrical signal via the magnetoresistive behaviour of the spintronic transducer. The goal of the present project is to advance in the design and realization of microarrays of biosensors based on spintronic transducers, pushing the limit of detection towards or beyond the actual values of standard bulky techniques based on fluorescence. the reading of the transducers is electric, allowing for a true miniaturization of the diagnostic tool. L-NESS has a considerable experience in spintronics, from the growth of the epitaxial hetero-structures to the realization and test of the devices. ICRM possess the know-how for the functionalization of surfaces, having already developed and applied suitable protocols of immobilization of probes to other biosensors based on fluorescence. IFOM is active in the field of molecular oncology, where we are planning to validate our biosensors. The final aim is developing a lab-on-chip system based on spintronic biosensors with biological sensitivity comparable or better than that of standard bulky systems like fluorescence. The development of the lab-on-chip will be done with reference to a relevant clinical application which will be used for the comparative validation of the lab-on-chip system, i.e. the measurement of the level of mRNA prep1 in tumors for the identification of patients affected by lung cancer who do not need chemotherapy after a surgical removal. The proposed project aims to enhance understanding and advance in the design and construction of a new type of compact diagnostic tool for the analysis of biomarkers in biological samples, oriented	to point of care medical applications and based on a lab on chip approach including microarrays of	spintronic biosensors. As specific application for validation we will consider the identification of	patients affected by lung cancer who do not need chemotherapy after a surgical removal of a tumor,	via measurements of the level of Prep1 mRNA in biological samples taken during the surgical	intervention. 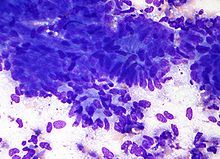 Micrograph of a lung lymph node biopsy showing metastatic colorectal adenocarcinoma. Our design will consist in a chip with 24 sensor points functionalized with specific oligonucleotides and coupled to a microfluidic apparatus for the delivery and transport of the liquids onto the sensor surface. The realization of spintronic transducers and coatings for probe immobilization is based on the development of innovative materials: complex epitaxial heterostructures are the basic ingredients for the subsequent realization of spintronic devices, via micro and nanofabrication techniques for the lateral definition, and buffer polymeric layers with high density of binding sites uniformly distributed on their surface are necessary for the immobilization of biologic probes. The relevant output of the project will be the evaluation of the viability of application of spintronic biosensors to medical diagnosis. In fact the research on spintronic biosensors is really at the early stage and comparative studies of their performances in connection with those of bulky standard techniques are of major importance. A. Cattoni D. Petti S. Brivio M. Cantoni R. Bertacco and F. Ciccacci: MgO/Fe(001) and MgO/Fe(001)-p(1X1)O interfaces for magnetic tunneling junctions: a comparative study, Phys. Rev. B 80, 104437 (2009). M Donolato M Gobbi P Vavassori M Cantoni V Metlushko B Ilic M Zhang S X Wang M F Hansen and R Bertacco: Detection of a single synthetic antiferromagnetic nanoparticle with an AMR nanostructure: comparison between simulations and experiments, J. Phys. : Conf. Ser. 200, 122001 (2010). M. Donolato M. Gobbi P. Vavassori M. Leone M. Cantoni V. Metlushko B. Ilic M. Zhang S. X. Wang and R. Bertacco: Nanosized corners for trapping and detecting magnetic nanoparticles, Nanotechnology 20, 385501 (2009). M. Donolato P. Vavassori M. Gobbi M. Deryabina M.F.Hansen V. Metlushko B. Ilic M. Cantoni D. Petti S. Brivio and R. Bertacco: On-Chip Manipulation of Protein-Coated Magnetic Beads via Domain-Wall Conduits, Adv. Materials, (accepted in 2010). Marco Donolato M. Gobbi P. Vavassori V. Metlushko B. Ilic and R . Bertacco: On chip nanomanipulation of magnetic particles for cells and molecules handling, 13th International Conference on Miniaturized Systems for Chemistry and Life Sciences (microTAS 2009) Jeju Korea (2009). P. Vavassori V. Metlushko B. Ilic M. Gobbi M. Donolato M. Cantoni R. Bertacco: Domain wall displacement in Py ring for single nanometric magnetic bead detection, Appl. Phys. Lett. 93, 203502 (2008).